Hello REDucers! Our mission to fight software complexity is going to be showcased alongside Ethereum's Devcon IV in Prague. 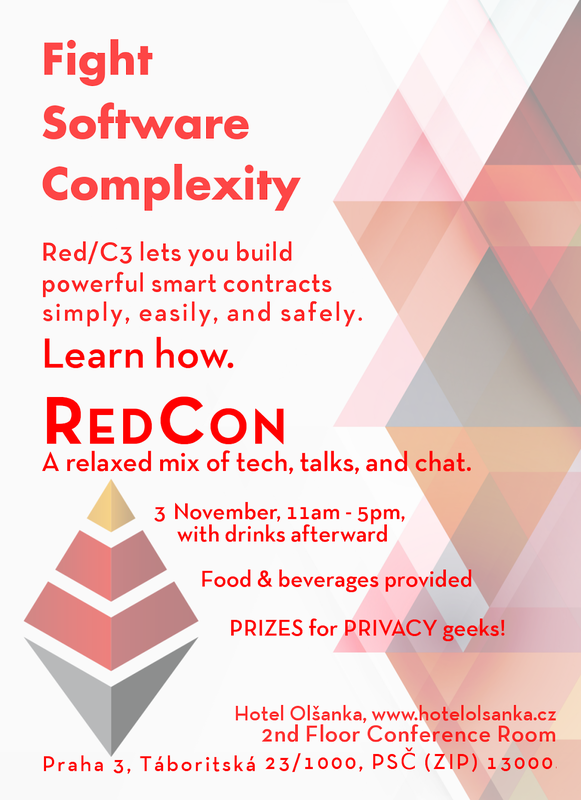 If you're in the neighborhood, stop by Redcon! Redcon is for anyone interested in open-source, full-stack, domain-specific languages built using Red Language or any of its dialects. We'll be having a casual meetup-style event, with food and adult beverages. 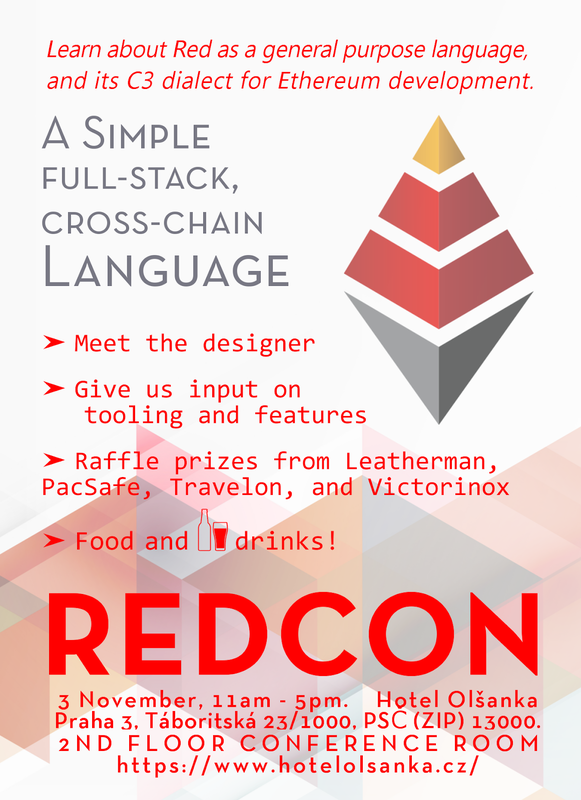 Red's designer, Nenad Rakocevic, will discuss the language and its capabilities. A Q&A session, presentations and demos are also on the agenda. Also present will be Gregg Irwin, leading governance and language design for the Red Foundation. Other core contributors to Red (The Team Red Irregulars) are coming too. Hotel Olšanka, Praha 3, Táboritská 23/1000, PSC (ZIP) 13000. Secure ETH and RED token transactions. Support for the world's leading hardware key: the Ledger Nano S.
HD derivation path support: access up to 50 public addresses with the same key. Fast balance retrieval (thanks to nodes provided by the Red Foundation). Fully open source on Github. Runs on Windows 7/8/10 and macOS 10.1x. Under 300 KB (on both Windows and Mac), no installation, no setup, no external dependencies! Tiny wallet source code: ~500 LOC of Red (plus ~110 KB of Red libs). Custom USB drivers for hardware keys, written in the Red/System DSL. Easy binary checking service to verify that your wallet app is a legit one! Source code under audit by third-party security experts. We've added a few more LOC. The main wallet code is now 600 LOC, and the new batch feature (explained below) is 300 LOC. First, and perhaps most important, is support for Trezor hardware keys. After the Ledger Nano S, the Trezor is the most popular key out there, and they have a nice new version as well, to stay competitive. 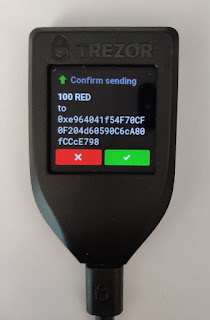 If you have a Trezor, now you can use the Red Wallet with it. As with the Ledger Nano S, the USB driver for the Trezor is written in Red/System, and built right into the wallet. An added bonus is that the Trezor is smart enough to show the correct destination address when sending RED tokens. Note that you need the latest firmware on your Trezor for RED token amounts to show correctly. If your firmware is outdated, you may see "Unknown Token Value" on the Trezor display when sending tokens. Another nice feature, though without an obvious UI affordance yet, is batch payments. If you send the same amounts to the same addresses, on a regular basis, you'll love this. You can set up a list of addresses, amounts for each, and then click Send just once. You then need to confirm each transaction on the hardware key (that's why we prefer them), but you don't have to go back and forth between the key and the Wallet UI. Click, click, click, and away they go. If a transaction is successful, you'll see a small √ appear next to it. If it fails for any reason, a × will appear. To see the detailed results, click the Results button. Successful transactions will open in a browser tab for the network they were sent on, while failed transactions will show the reason in a small window on the desktop. To access the batch payments screen, select an address in the list, then right-click on it. Select Batch Payment from the context menu, and a batch transaction dialog will open. Add new items, or remove those you don't need. To save a batch for future use, click the Export button. To reload one, click Import. Yes, you can have multiple batches for different purposes. We have more UI changes in the works, to improve usability, and more features to come. For example, you can only send ETH in batch payments today, but we plan to support RED tokens there as well. We're also experimenting with how best to verify stored addresses. Batches are simple text files today, which you can even create by hand if you want, but may be secured in the future. Remember, always verify addresses! We've also added some new back end pieces, so balance loading is much faster now. We believe we're the fastest wallet out there in this regard. There are also some improvements in how the Wallet handles various hardware key states, which is a fun challenging thing to test and debug, and a few small internal improvements and added tests. With this release, we'll also update our binary checking service, so you can make sure you've got an official, secure build from us. If you want to check if your RED Wallet binary has been tampered with in any way, you can simply drag'n drop the wallet executable on our binary checking service. If it's valid, the screen will turn green and show you the version (0.2.0 for this release) and target OS. If it turns red with a warning message, please notify us on Gitter or Twitter at once. So far, we haven't had any attacks for fake wallet instances reported. And you can always access the source code, to see how it works, and have your own audits done, in addition to the audits we have done. Just click on the executable to run it (extract the .app file first on macOS), no installation or setup process required. Plug in your Ledger Nano S key and enjoy a smooth and simple experience! Only download the RED Wallet app from this page, do not trust any other website for that. There's a lot more in the works, but we're in the throes of preparation for Ethereum DevCon IV, with more exciting news to come on that side. If you missed the announcement for the initial Wallet release, you can find it here. Stay tuned, and Happy Reducing! Usernames in this update are all Github usernames. Last week in Red saw contributions from across the spectrum from our heavy hitters. In the midst of gearing up for Ethereum’s Devcon 4 in Prague at the end of October, a diverse number of elements are getting worked on. @qxtie has added Trezor hardware support to the Red Wallet, in addition to the LedgerX hardware, a goodly chunk of work (see: here) as well as the ability to set up a batch of payments. There is also new support provided for homebrew APIs for fetching balances, for those who DIY. This is still work in progress, but we’ll write it up in detail when it’s ready. There has also been a lot of work done to add bitcoin support to the wallet, but bitcoin is messy, and we're still looking at whether it's worth including. In Red specifically, a number of modifications have been made to work around MacOS issues, and extra attention paid to the GC/recycle facility, with fixes and tests from @dockimbel, @PeterWAWood, and @qxtie. As for new issues, some GUI aberrations have been observed, related to the appearance of checkboxes and buttons. While not blue-screen-of-death critical, they have been flagged as bugs and will be addressed.Cross platform GUIs are hard, which is why so few do them. In the community, some great discussion has been transpiring around the issue of Red’s mission: is it, or should it be, for “everyone” as our public-facing documentation states? And many folks have stated that while they generally don’t pay for software themselves, they WOULD be willing to shell out for a comprehensive book volume (chat is here) on the subject of Red. Join the discussion at https://gitter.im/red/red. Also, more cool demos from @toomasv, who built a protototype interactive GUI editor, and demoed it building a little live-code app. 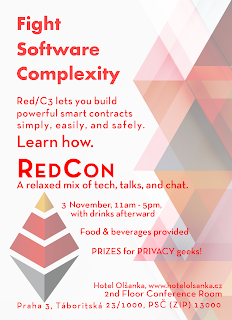 If you will be at Ethereum DevCon 4, or in the general area of Prague during the first week of November, hit up @GreggIrwin or @dockimbel; they will be hosting a small, informal RedCon after the main Ethereum event. We’d love for you to be there. 1) Do you consider yourself a programmer? 2) Do you consider yourself a software engineer? 3) Do you solve business problems with software? 4) What kind of problems do you solve? 5) What other languages have you used? 6) What is your favorite language, and why? 7) Is "progammer" or "developer" in your job title? 8) Do you think Red should be for "everyone" (e.g., like Visual Basic)? 9) Do you want to use Red for real work, or just fun? 10) What software do you pay for?